Whichever way you come into our village, you come down hill- we nestle in a depression in the surrounding countryside. For this reason, when there is a large quantity of rain, all of the surface water travels downhill to the village. 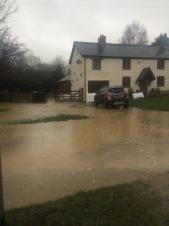 Whilst floods in the village are not frequent, when they do happen, they happen quite quickly, and they are always caused by surface water flowing from the surrounding fields and flowing down the roads into the village where the elderly drainage system cannot cope. 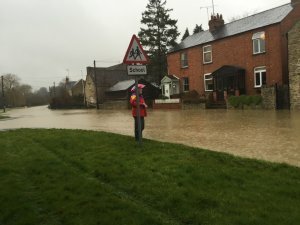 In 2015, the village became part of Northamptonshire County Council's "Pathfinder Project", and a grant of £3000 was given to the village to purchase flood protection equipment. As a result of this, the "FART" committee was established, under the chairmanship of parish councillor Paula Chaplin. The main objective of the committee is to help property owners to take the necessary steps to alleviate the damage caused by flooding, and to help residents to be safe in the event of a flood. However, although the committee can advise residents on how to protect their property, and can provide a list of recommended flood protection products, it is the responsibility of owners to protect their own property. Only a small stock of flood defensive equipment is held by the committee for use in cases of emergency. A rainfall gage has been sited in the village, and, in theory, when the rainfall reaches a certain level and there is a danger of flooding, messages will automatically be sent to the village flood wardens. The flooding in the village could be greatly reduced if all local landowners carried out their responsibilities to ensure that ditches are adequately maintained. The committee also puts pressure on NCC to have the drainage system in the village maintained, although with the shortage of funding at the County Council this is not always carried out. The orgnaiser of the Flood Team is Paula Chaplin (1 Meadow Rise).